I bought my first pair of John Fluevog shoes in the 10th grade. I saved my babysitting money and ordered up a pair from their mail order catalogue. I paid the mailman COD. When I met my Daniel and looked down at his Fluevogs, I knew he was the man for me. My things to look for in a man were his nose, his hands, his style, and his shoes. This video shows just how special these shoes are. 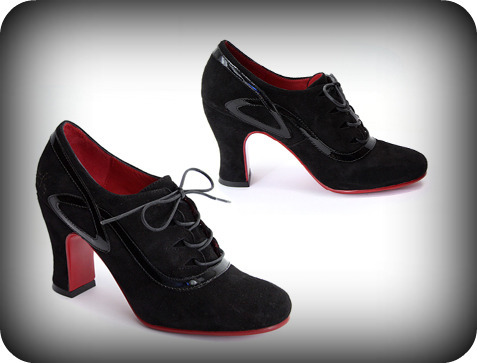 FlueBlog – Watch the production of a Fluevog Miracle! We may not have a hundred pairs of shoes but we do have shoes that last a long time. If I could pick a pair from their shop right now, I would pick The Miracle Lanciano's. Don't you just love "lookie-lou wish" shopping? p.s. Do you recognize anything here? I like the Kerouacs in brown. Could you please tell me how you pronounce this? I think I say Flay-vogs and it should be otherwise. I'm thinking the Body Part pump for dress up and the Earl of Warwick Wessex for not. I would feel like a bad a wearing those. Love that your cute tootsies are up on their site. I knew those patriotic stockings in a heartbeat! I have GOT to go to bed!!! Amazing shoes, I've never heard of them before. I loved the video of the shoe being made. What a fantastic process to watch! I'd never heard of this make either. But how fun! I luuuurve the Molly Johnsons in brown and pink. I do love a nice shoe! i really should be looking at their boots but with shoes like munster, pilgrim and promise - i'm lost! forget saving pennies, i need to be thinking quarters. loved your flueshots!!! OMG are these the best shoes in the world??? I'm off to investigate on the net.